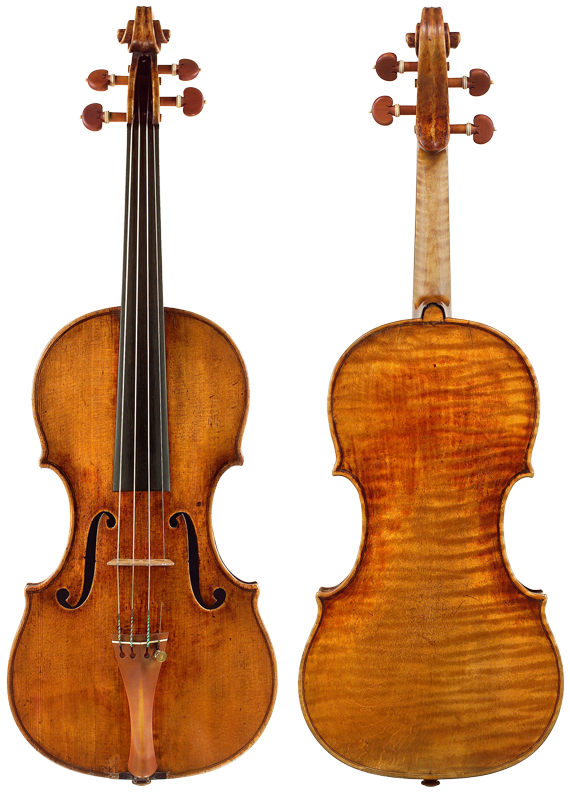 December 23, 2016, 12:32 AM · Congratulations to violinist William Hagen, 23, who has been granted long-term use of the 1735 "Sennhauser" Guarneri del Gesù from the Stradivari Society of Chicago. William Hagen plays the 1735 "Sennhauser" Guarneri del Gesù after receiving it from the Stradivari Society. Photo by L. Kapson. A third-place laureate of the 2015 Queen Elisabeth International Competition in Brussels, Hagen has performed as a soloist with symphonies around the world, including the Albany, Fort Worth, Jacksonville, St. Louis, Shreveport and Utah Symphonies, Aspen Philharmonic, Brussels Philharmonic and the Sendai Philharmonic Orchestra. He has performed with conductors such as Marin Alsop, Plácido Domingo, Michael Stern and Hugh Wolff; and with artists such as Gidon Kremer, Christian Tetzlaff, and Steven Isserlis as part of the Chamber Music Connects the World festival at the Kronberg Academy (Germany). 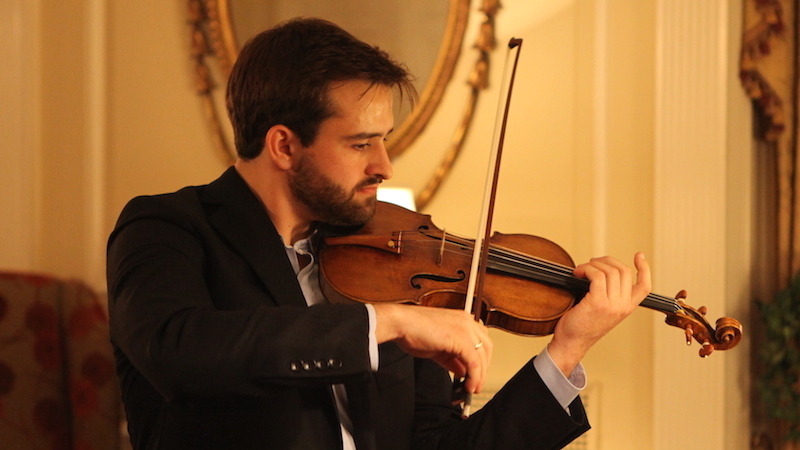 Before receiving the del Gesù, Hagen played a 1675 Andrea Guarneri, which "is an absolutely beautiful violin that I have felt so lucky to play, but it is not as powerful as a Strad or del Gesù," Hagen said Thursday. Hagen received -- and test-drove -- the "Sennhauser" del Gesù Wednesday night at a Stradivari Society recital at the Woman's Athletic Club of Chicago. "I have only had the 'Sennhauser' for a day, and I can tell I have a lot to learn about how to best use it," Hagen said. "It's quite different from the Andrea Guarneri, and I want to bring myself up to speed as soon as possible. It is an absolute blast to play on -- it has so much character and so much strength. I had been looking for a violin that would project better than the Andrea Guarneri without losing its beauty of sound, and I think this violin does exactly that. I feel so incredibly lucky. I have dreamed of playing on a violin like this for as long as I can remember." His first public appearance with the del Gesù will be a performance of the Bach A Minor concerto with Nicholas McGegan and the Pasadena Symphony on Jan. 21. The first Strad Society recipient of the "Sennhauser" was violinist Leila Josefowicz, who was just 13 at the time. Hagen and Josefowicz have another thing in common: both were students of Robert Lipsett. Hagen, a native of Utah started playing the violin at age 4 and debuted at age nine with the Utah Symphony. At age 10, began commuting weekly to Los Angeles to study with Lipsett at the Colburn Community School of Performing Arts. After studying with Itzhak Perlman at The Juilliard School for two years, he returned to Los Angeles to continue with Lipsett at the Colburn Conservatory of Music. Last fall he joined the Kronberg Academy in Germany. He is also an alumnus of the Verbier Academy and the Perlman Music Program and Aspen Music Festival and School. BELOW: William Hagen plays Eugene Ysaye’s Sonata No. 4 in E minor, Op. 27 in the semi-finals of the 2015 Queen Elisabeth International Violin Competition in Brussels, on his previous violin. December 23, 2016 at 06:24 PM · What a beautiful and smooth sound...heavenly. I love the practice of lending these great violins out to deserving players. They get played, and we get to hear the wonderful music.